NOTE: Pacific School's Independent Study/Collaborative Teaching and Learning Program program currently has openings 2018-19 and 2019-20. Please complete one of these forms to express interest in enrolling: INTEREST FORM 2018-19 or INTEREST FORM 2019-20. ​What is the Independent Study (IS) Program? Pacific Elementary School’s Independent Study (IS) Program is a blended program consisting of three days per week of multi-age classroom learning and two days per week of home study. Home study is supported by field trips and teacher-provided curriculum. This structure allows IS families and teachers to build a strong, supportive community where students are engaged, enthusiastic learners, growing and thriving both academically and socially. When does the classroom part of the program meet? Both IS classrooms meet Mondays, Tuesdays, and Thursdays, starting at 8:40. Kindergarteners are dismissed at 12:30, and all other students are dismissed at 3:00. Classes start after Labor Day and then follow Pacific School’s calendar. The school year before Labor Day is used for individual family and IS Community organizational meetings. What is the focus of the classroom part of the program? The main focus of both the K-2 and the 3-6 classrooms is math and writing, although social studies and science are usually taught in both classrooms. Subjects are taught by the teacher and parent volunteers through whole group instruction, small-group activities, and individual lessons. Students also participate in a variety of other classes and enrichment activities. While these vary from year to year depending on parent volunteer skills, funding, and teacher interest, they may include Life Lab (school garden), library time, class fundraisers, physical education, dance, art, music, Spanish, leadership, etc. In addition, IS students have the opportunity to participate in all school-wide programs available to 5-day students (described in more detail below). You can learn more about the K-2 classroom by visiting Mrs. Nickel's Classroom Website. What type of curriculum is used in the Independent Study program? The core curriculum follows California State Standards, as adopted by the School Board. The IS program is an alternative method of implementing the curriculum, not an alternative curriculum. IS classrooms use a variety of teaching methods including individual, small-group, and whole-group instruction, collaborative and interdisciplinary projects, hands-on activities, discussions, textbooks, workbooks, etc. Classroom volunteers are encouraged to be creative and have produced a diversity of amazing lessons over the years. The teachers collaborate and coordinate schedules so that students may travel between the two classrooms as appropriate for their learning needs. Students in grades 3 through 6 participate in California’s state-mandated assessment programs, including the CAASPP assessment. What opportunities are there for gifted or advanced students? Students who are academically ready to work above their grade level are welcome to work with an older group of students. Historically, it has been common for students to move into the most appropriate math group for their abilities, with some students working a year or two ahead and the occasional student working much farther ahead. When appropriate, students may also join above grade-level groups for other subjects as well. In addition, Pacific School is one of few elementary schools in the area maintain a Gifted and Talented Education (GATE) program. Starting in fourth grade, IS students may participate in our GATE program taught by Wendy Milette. What happens during the at-home part of the program? Home-study time is an essential and required part of the program. Parents must provide documentation of home-study in a manner approved by the teacher and district. However, creativity is welcome, and different families use very different approaches to complete home-study requirements. For some families, home-study is very much like completing homework assignments typical of many 5-day programs. Other families take a more project-oriented or creative approach. IS field trips (described below) supplement, but do not replace, supervised home study. Families and teachers meet approximately every 6 weeks to turn in documentation packets, discuss student progress, and plan for the next 6 weeks. Teachers offer materials, textbooks, workbooks, curriculum ideas, and training to interested families for the home study portion of the program. Documentation can take the form of originals or copies of student work, photographs of students engaged in activities, brochures or attendance records of classes, titles or copies of books read, music studied, poems recited, lesson plans followed, etc. If you are interested in seeing a sample of this documentation, contact the school office. Ongoing failure to complete assignments and/or provide adequate documentation of home-study will result in being removed from the program. How does the field trip program work? Parents plan field trips for about three Fridays of each month. All field trips are optional. However, they are an excellent opportunity for students and families to explore many of the amazing resources in the Santa Cruz and greater Bay area and to strengthen friendships and connections within the IS community. Generally, each family organizes about one field trip each school year, but this is flexible. Most field trips include all IS students, K-6, but some are organized for a narrower age range. 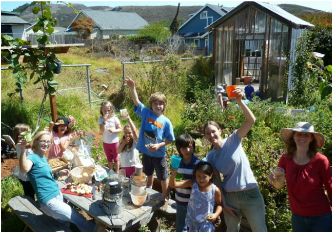 Some past field trips have included: local farm tours, sewing and craft classes, horsemanship, animal shelter, land fill and recycle center tours, Exploratorium, NASA Ames Research Center, San Francisco Zoo, Santa Cruz Mission, etc. In addition, there are usually two 2-night camping trips organized each year, one in the fall and one in the spring. I'm worried that my student won't get all the skills they need to succeed. How do IS students do when they transition to regular schools? Research on home schooling and education in small groups has consistently shown that the rich adult-to-student ratios present in both environments result in substantial educational gains not generally seen in traditional classroom settings. In other words, students can learn and retain more with fewer hours per week of instruction. Likewise, research has found that the most accurate predictors of student achievement in school are not family income or social status, but the extent to which the family creates a home environment that encourages learning, communicates high yet reasonable expectations for the child’s achievement, and becomes involved in the child’s education at school. In addition, our own experience in over fifteen years of running the program is that students who graduate from IS are extremely well-prepared for middle and high school, having excellent study skills, social-emotional skills, and a well-rounded and diverse education. For some specific examples, see IS Quotes. How do parents and families contribute to the success of the IS program? The IS program uses parent volunteer hours to create a rich adult-to-student ratio for learning and to manage the logistical complexities which come with a classroom serving three or four grade levels. Each family is asked to provide an adult volunteer an average three hours per week/per child, typically, but not necessarily, in the classroom. While parent volunteer time is greatly appreciated and key to the success of the program, it is not a requirement for enrollment or continued participation in IS. Parents volunteer in many ways and formats, depending on their strengths, interests, and schedules. For example, a typical contribution is to volunteer in the classroom for one three-hour shift per week, either 8:40-12:00 or 12:00-3:00. During this time the volunteer usually teaches or assists with teaching a 60-90 minute class (such as math, writing, social studies, science, etc.) to a small group of students. While parents are encouraged to teach to their strengths and passions, core subjects have priority over arts, P.E., etc. Parents can also contribute to the program and the school by taking on tasks outside of the classroom, such as being the IS field trip coordinator, the IS Google Group coordinator, the IS carpool or bus chaperon coordinator, or by joining Parents' Club or Site Council. Prompt and regular attendance on classroom days is an expectation for all students, regardless of academic progress. Frequent or prolonged tardies or absences are disruptive to the community and learning process and burden parent volunteer teachers. IS students are expected to follow the same standards for attendance as other students at Pacific Elementary School. If a student is absent for more than 10% of the classroom days (11 days per year) for any reason, including home schooling, an evaluation may be made to determine whether independent study is an appropriate placement for this student. What types of students and families thrive in Independent Study? IS welcomes families who are looking for a blended program with a mixture of classroom learning, field trips, and home study. Families with many different family structures and educational philosophies have thrived in IS. Students or families who are not willing or able to regularly attend the classroom portion of the program. How do IS students interact with the rest of Pacific School? IS students benefit from the many fabulous programs and features of Pacific Elementary School, including its production-quality school garden, award winning school lunch program, extensive school library, proximity to San Vicente Creek and the beach (used for field science activities), and experienced, caring staff. There is childcare available from 12:30 to 5:30 which is open to IS students at reasonable rates. Pacific School offers a few after-school activities, including chorus. IS students in fourth through sixth grade have the option to participate in the instrumental music program. Fifth and sixth grade students have the option to participate in the school’s award winning FoodLab program. The school works to integrate IS and 5-day students through activities such as all-school meetings, the every-other-year drama production involving all third through sixth graders, mixed class lunch seating for second through sixth graders, cross age reading buddies, etc. My family lives in the Davenport School District. Are we guaranteed a spot in the Independent Study Program? No. Admission to the program depends on space available and whether the program is an appropriate fit for the student and family. If you are a new family interested in IS, follow the directions here. If you are a returning family interested in IS, follow the directions here. My family is interested in Independent Study, but we live out of district. How do we get considered for a spot in the program? If you are a new family, follow the directions here. If you are a returning family, follow the directions here. Most IS students are from out of district. Space availability and interest in IS are quite variable each year. Where can I learn even more about the program? The master agreement all families sign at the beginning of each year can be found here. Quotes from parents about the program can be found here. The program handbook supplement, which provides logistical information for new families, can be found here. You can learn more about the K-2 classroom by visiting Mrs. Nickel's Classroom Website. You can also call the school office and speak with Elizabeth Andrews, District Office Manager, who was an IS parent for many years. Kara Nickel, IS K-2nd teacher, with students. Terra Barsanti, IS 3rd-6th teacher, with students.